This is a very tasty roti and I love it. 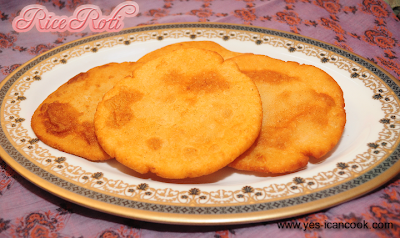 It can be both deep fried and pan roasted like a regular roti. I prefer the taste of deep fried rice roti. This is an ancestral recipe. It can be served with curry of choice or even with any chutney. I enjoy it with yogurt anr sugar or even just with some sugar. 1. In a mixing bowl add the rice flour and salt and mix. 2. Add the grated coconut, yogurt, ghee and mix well. Make sure that the yogurt is not sour. 3. Add water as required to make a soft non sticky dough. 5. Take a portion of the dough and make a ball with your palms. 6. Then flatten it between your palms to form a disc. It shouldn't be too thin. 7. Reduce the flame to medium and deep fry the roti till it is cooked and golden on both sides. 8. Make rotis with the remaining dough in the same way. 1. To roast the roti on a tawa, after flattening between palms place it on a hot tawa. When cooked on one side, flip it to the other side and cook. Use oil as needed to cook the rotis.